You can’t just preach to troubled kids; you have to listen to them. 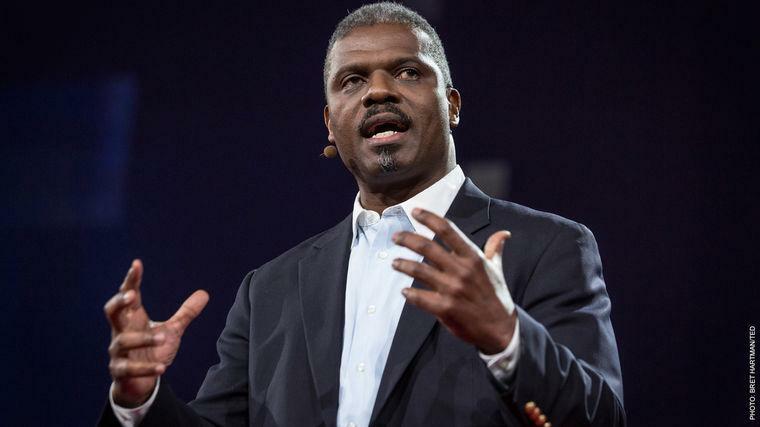 At TED 2015, Rev. Jeffrey Brown’s keynote garnered a standing ovation—and has since been viewed over 1 million times. Rev. Brown is currently the president of RECAP, which stands for Rebuilding Every Community Around Peace. He is also a co-founder of the Boston Ten Point Coalition, a faith-based group that was an integral part of the famous “Boston Miracle,” during which the city experienced a 79% decline in violent crime among youth from 1990 to 1999. That includes 29 consecutive months of zero juvenile homicides. The efforts also spawned countless urban collaborative efforts in subsequent years, and was widely covered in the press. Rev. Brown is also the host of the podcast The Courage to Listen, available on iTunes, Google Play, and Feedburner. Each episode offers stories and insight from the people—clergy and politicians, former gang members and street workers—striving to reduce violence. And each episode discusses timely issues such as community-police relations, the Black Lives Matter movement, gang-based mindsets, urban unrest and protest, and more. For his service, Rev. Brown was named the 2016-17 Brandeis University Richman Distinguished Fellow in Public Life. As a young pastor, Rev. Jeffrey Brown was dismayed to see his Boston community disintegrate around him, as gang-related violence and drugs pushed kids into lives of crime and addiction. As a leader behind the “Boston Miracle,” Brown saw the first stage to improving the neighborhood was to listen to the kids affected—and not simply preach to them—and thereby equip them with the tools to decrease community violence. Listening to make change is just one of the many leadership strategies Rev. Brown has picked up along the way, and he shares them in this talk. The best type of leadership is the kind we can do collectively, he says. It’s a stirring story coupled with powerful takeaways on how to lead, how to communicate, and how to strengthen your organization. As crime rates decrease in any area, the local business climate naturally improves. This in turn drives up housing prices, as developers realize they can now sell to more affluent buyers. But this also means the people most affected by violence—the original residents, who often work hardest to escape its grasp—are squeezed out due to the costs of living in this newly gentrified area. To Rev. Jeffrey Brown, it doesn’t have to be this way. Through his organization My City at Peace, Rev. Brown collaborates with housing projects and local authorities to rebuild communities affected by violent crime. But he wants local residents to experience this revival, too. He wants people to see the growth and healthy flourishing of their own neighborhoods, and see these new eras of peace sustained. In this inspiring keynote, Rev. Brown advocates for mixed-use communities, made up of market-rate, affordable, and Section 8 housing: communities of greater class integration, harmony, and co-operation, and more meaningful communication and leadership across all sections of society. How Can Listening Transform An Entire Community?